They can be emitted through a process known as off-gassing from many common household items and consumer products including processed wood, carpet fabric, sofa materials, cleaning products, freshly painted walls, new cushions, and mattresses. VOCs are potentially harmful. They are known to cause Sick Building Syndrome and Building Related Illnesses. Some VOCs are also endocrine disrupting chemicals, which means they can cause a wide array of diseases and conditions. 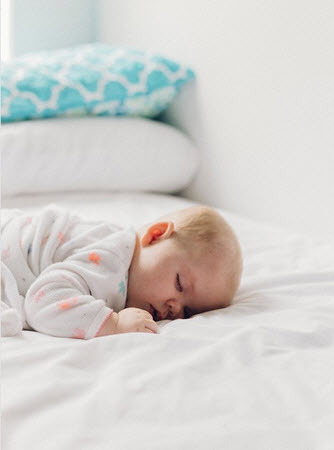 As a new mum, you should take steps to limit your baby’s exposure to VOCs because newborns and infants are more susceptible to the negative effects of VOCs. Where do VOCs come from? Carpet fabrics, mattresses, and even car seats are known to emit VOCs such as benzene, acetaldehyde, toluene, and formaldehyde, all of which have negative health effects in humans and pets. In a study carried out at the University of Texas, 20 mattresses made of polyurethane and polyester were tested for VOC emission. researchers found that all the mattresses produced VOCs and that new mattresses produced up to 4 times more VOCs (in terms of volume) than older mattresses. The mattresses that were tested in the study came from 10 different manufacturers, which means that the presence of VOCs in mattress and cushion foams is an industry wide problem. However, many of them are overwhelmed by the high cost of higher education, and some are even forced to drop out of school. If you are a student looking for ways to help fund your education, here are some opportunities that you can take advantage of. Applying for scholarships and grants Students can take advantage of the numerous scholarship and grant programs from the government, non-governmental organisations, as well as private companies. Government grants and scholarships are usually very competitive and in short supply, so most students have a much better chance of getting scholarships from private entities such as businesses, companies, religious organisations, among others. If you are a student, you can easily find a list of available scholarship opportunities on your university or college website. To increase your chances of winning a scholarship, do your research and apply to all the programs for which you are eligible. Taking part in essay writing and creative contests Many businesses stage creative contests with cash prizes to help students fund their higher education. These contests aim to nurture creativity and innovation and to raise awareness on certain topics. 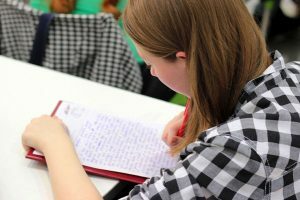 Essay writing competitions are by far the most common types of contests that are created by companies because they are easy to carry out. When choosing a childcare centre, you want to ensure that your child is going to be happy, safe, healthy, and mentally stimulated throughout the day. This means that the centre you select should be welcoming, friendly, and clean, and the people who work there should be dedicated to protecting children and helping them to develop. Here are a few tips on how to find a good childcare centre for your child. Ensure that the childcare centre is located close to where you live or work The centre should be close to your house and your place of work for the purpose of convenience. Mornings are usually hectic since you have to get your kid ready, drop him off, and get to work. If you want to beat the morning traffic and to get to work on time, the last thing you need is a long detour. Picking your child up in the evening is also much easier if the centre is on your way home. If you use public transportation, make sure that the centre is located near a station. Ensure that the childcare centre follows hygienic cleaning practices Hygienic cleaning practices are extremely important in a childcare centre because your child's health and well-being depend on it. Our children live in an age of unprecedented digital connection. They sms, mms, tweet, post, like, digg all aspects of their life and their thoughts. They are sharers and keep in touch with their friends almost instantaneously via their mobile devices and computers. All their communications and information is going online, not just in their sms messages, or photos posted, or words tweeted but in online game chat rooms, liking Facebook posts, comments on blog articles, images uploaded via mobile apps that own the data they are uploading and the list goes on. How do they know who has access to this information? Have they secured access to it properly? Should it have even been posted online at all? As a parent, have you had discussions with your child about what digital reputation is and how your child can manage their online image? As a parent are you aware of different ways to manage online access in your home to foster a balanced use approach? Cybermums is here to support and educate parents about the risks their children face online and the digital security they can implement to help keep their child safe online. We actively encourage open discussion and family decision making regarding the use of technology in the home. 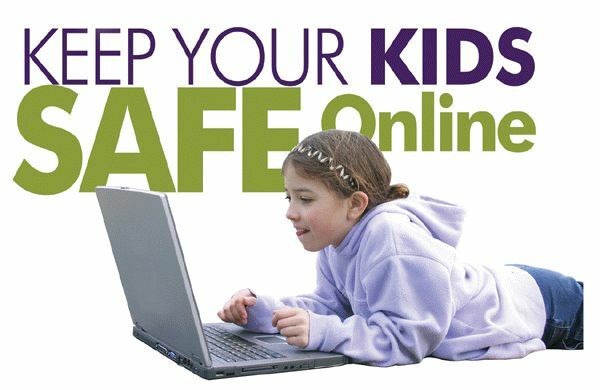 Learn strategies for managing your child's access to the internet and computer games. At Cybermums we encourage open discussion with our children regarding their use of the internet and access to online and mobile apps. Following these 7 simple tips for responsible photo sharing can save a lot of heart ache and damage if a photo is shared in haste or without consideration. 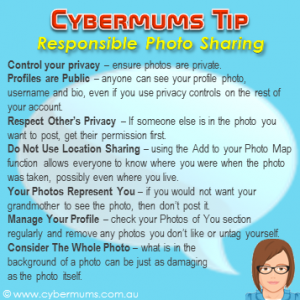 Control your Privacy It is important that you have control over your own photos and whether they are private. Most apps have a privacy and security section, usually in the Settings area, where you can specify who can access, see, comment on and share your online photos. Review your privacy settings regularly and keep up to date with the official guidelines for sharing and ownership of photos uploaded to the website or app. Some social networks own your photos once you upload them and can use them for their own purposes if they desire. If an app or website does not have privacy settings then I would strongly suggest not using it. Profiles are Public In most social networking sites anyone can see your profile photo, username and bio, even if you use privacy controls on the rest of your account. So using that underage drunk photo of you smashed at the last party you went to, or lounging in your bed might not be the image you want to portray to the whole world. I think I saw the pot at the end of the rainbow this week. It was amazing, colourful and all the kids were smiling, it had to be paradise! Not only am I the Cybermum, presenting cybersafety incursions to students and cybersafety seminars and workshops for parents, I am also a member of my schools P&C. Also, the P&C rep on the schools ICT committee to boot. As part of the schools commitment to expanding the ICT resources for students and more seamlessly incorporating this technology into daily school life, the ICT committee at my primary school visited West Leederville Primary school in Perth, WA. Even though we were running through the rain, trying to dodge storm clouds in between visiting the buildings and classrooms, it was a great afternoon filled with enthusiastic kids using iPad minis in their classrooms as part of their normal curriculum tasks. The work done to really bring this technology into the classrooms and the hands of students has been performed extremely well at West Leederville, specifically by two of their key ICT staff being Michael McInerheney and Paul Reid. 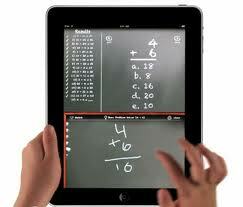 The school had focused on Apple products, having MacBooks, iPods and iPad minis available for students. Cybermums wants your input into what topics are important to you with regard to your childs online education. Complete our Parent Media & Technology survey to tell us what you think about social media and how you engage your child and regulate their media use.